← John Brown; 2018 Report 3. SHUFFLEBOARD PROGRESSES. 2018 10 24. An Inspirational Personal Story by Allen Dronsfield!! 2018 10 25. St. Pete Shuffleboard Club, the oldest and largest club of its kind, returns to the FSA schedule for a State Mixed Doubles tournament, the first State Tournament in many years. Allen Dronsfield Speaks: St. Pete once boasted a membership of 5 – 6 thousand in its hay day. Members at the time built the buildings which are now on site. To-day, the large clubhouse complete with fireplace and a newly added air conditioning system is full of history. This was My first sanctioned tournament at this historic site. As I entered the confines with wife Jan, I could only imagine what it could have been like with 5 – 6 thousand members. I had this wonderful feeling come upon me, realizing I had just entered this special place. It put a pleasant little smile on my face that stayed with me the entire tournament. St Pete wasn’t always crowded; membership fell upon hard times and actual numbers dwindled to a double-digit number. On the occasion of to-days event, the first State Tournament in many years, I am, experiencing the opportunity to play with the living legend of the Club, Mary Eldridge. Mary’s background is second to none among the living. She once partnered with the late great Mae Hall; Mary, almost single handedly brought this historic site back to life with a lot of hard work, giving up her game for years. Remarkable as it may seem, the club membership is now back up to 1400, mostly of the younger generation, people that are still in their professional careers. The competitors this week would also be coming to put their mark in the history books of this great facility. The likes of Mike Vassalotti, Nancy Sclafani, the Myklejords, Sue McLaughlin seeking her elusive 1 point to make the FSA Hall of Fame, partnered with Mike Seyfer; the list goes on. Due to unfortunate circumstances Earl Ball could not make this event with Joan Cook. Many accomplished shufflers headed to Lee County Ft. Myers for the other mixed dbls. event. At St Petersburg, as day one began, many are hoping to get their hands on the larger than normal payout. Others were looking to up their points, and then there was Erik Hahmann and Kerry Baily, setting their sights on upsetting the older generation as the young guns. Day one begins to unfold, and the numbers begin to decline through the elimination process. Sue McLaughlin partnering with Mike Seyfer, were early departures followed by Steve Raimondi and Arlene Guerrini. As the stage was being set for day two, Gus Bondi and Marion Lohbusch had been put into consolation and chose not to return for the semis. They forfeited and took the 4th spot, followed by Dean and Nancy Myklejord, they too would not return and settled for 3rd in consolation. This left Walt Bartels and Cheryl Cole battling for first and second in consolation with Jerry Curwin and wife, Joan. Day two would have them in a viscous kitchen match; the Curwins prevailed. On to day two, as the morning began, Allen Dronsfield and partner Mary Eldridge would take on Dwayne and Judy Cross in the semis. Allen and Mary would go on to win that match. The other semi match was the fiery redhead from Bradenton, Nancy Sclafani, partnered with the GOAT (greatest of all time), Mike Vassalotti, they had their hands full with the young guns, Erik and Kerry the local hopefuls. Erik and Kerry edged out the Hall of Famer’s, they would now go on to play new FSA Hall of Famer Allen Dronsfield and the legend, Hall of Famer Mary Eldridge. 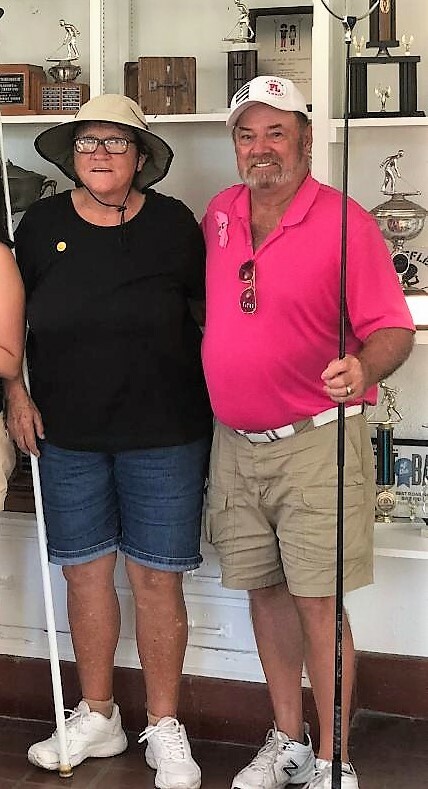 Mike Vassalotti and Nancy Sclafani took on Dwayne and Judy Cross, Mike and Nancy took that one and finished 3rd and Dwayne and Judy forth in the main. What I had hoped for was to play on the legendary stadium courts. Many a significant match had been played on these courts. Courts reminiscent of the center court at Wimbledon. The bleachers had many local’s present to support the young guns against the veteran Hall of Famer’s. Allen and Mary got off to a quick start and took the first game playing yellow, Erik and Kerry returned the favor after changing colors and won the second game. It now came down to a third and final game and Erik won the lag. They of course would remain on yellow. They had the veteran’s down 40 – 6 in short order, however the veterans weren’t going away without a fight. About that time the momentum changed and in very short order the veterans had turned the score around to a 23 – 74 score and Mary scored her hammer and Allen Dronsfield a Zephyrhills Shuffleboard Club member and Mary Eldridge won the Championship on the legendary stadium courts at St. Pete Shuffleboard Club. On a personal note, this was an especially great victory for me as that little smile got bigger and being now a part of the rich history and with a true legend, Mary Eldridge. 2 Responses to An Inspirational Personal Story by Allen Dronsfield!! 2018 10 25. WOW. What a turn around in the 3rd game. Way to go Al…must have been fun to play with Mary!